Heat oven to 450°F. Make pie crust as directed on box for one-crust baked shell, using 9-inch glass pie plate. Cool completely, about 45 minutes. Place chocolate chips in large bowl. In medium microwavable bowl, microwave 1 cup of the whipping cream uncovered on High 1 1/2 to 2 1/2 minutes or until very hot but not boiling. 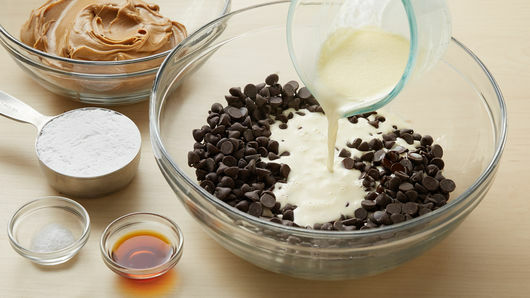 Pour hot cream over chocolate chips; stir with whisk until chocolate is melted and mixture is smooth. Stir in 2 cups of the peanut butter, 1/2 cup of the powdered sugar, 2 teaspoons of the vanilla and the sea salt until mixture is well blended. Place 1/4 cup of the cereal evenly over bottom of baked pie crust. 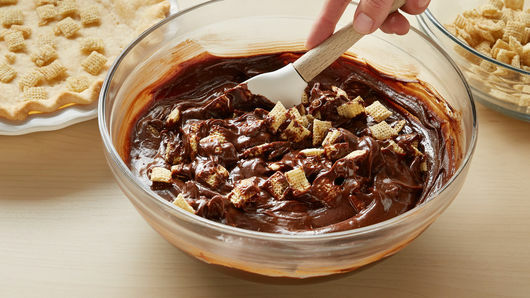 Add remaining cereal, 1 cup at a time, to the chocolate mixture; fold gently so cereal is not crushed. Spoon chocolate mixture over cereal in pie plate; spread evenly. Refrigerate uncovered pie about 2 hours or until set. 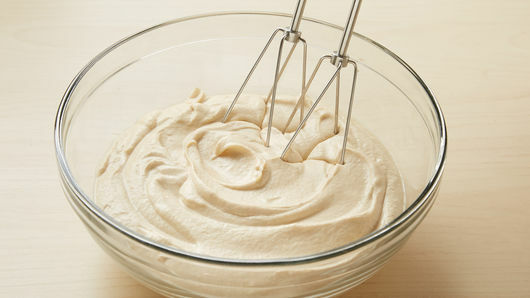 Meanwhile, in medium bowl, mix remaining 2 cups whipping cream, 1/2 cup peanut butter, 1/4 cup powdered sugar and 1 teaspoon vanilla. Beat with electric mixer on low speed until well blended. Beat at high speed 30 to 60 seconds or until soft peaks form. Do not overbeat. Cover and refrigerate until serving time. To serve, cut pie into slices; top with peanut butter whipped cream. Store covered in refrigerator. Chex™ Muddy Buddies™ are an irresistible snack made from Chex cereal, peanut butter, chocolate and powdered sugar. I have always found that the best thing about food is its magical ability to transport you to particular moments of your life. You know what I mean—when it hits your tongue and you close your eyes and for a few fleeting seconds you’re back at grandma’s dining room table savoring every bite she serves you, or you’re in the kitchen with mom standing on a chair at the counter next to her, more than happy to tip extra chocolate chips into the cookie dough and lick the spoon. Food is the best supporting actress of our lives and the best recipes are the ones that remind you of your memories. You might laugh when I tell you that one of the best recipes ever shared with me was for Muddy Buddies™ snack mix—the one with Chex™ cereal, chocolate, and peanut butter that’s melted, mixed and then doused in a heap of confectioners’ sugar. Sarah, my best friend, introduced me to this delicacy in the back of a crammed passenger van, on our way to our first basketball game about 15 years ago. She plopped a giant bag her mom had made between us, and that is where a bite of Muddy Buddies™ always takes me: to the middle bench of the van, huddled next to Sarah, a shared pair of headphones in our ears, arguing about which song we should play next and eating Muddy Buddies™. After that, Muddy Buddies™ became our “thing.” It wasn’t just our pregame snack. We had it all the time and everywhere, like movie nights on the couch, road trips to NYC, perched on the seawall in our hometown the eve before college, sitting in her front yard as the Thanksgiving Day parade passed by. Years later, after Sarah moved across the pond, we would each munch on Muddy Buddies™ on our respective ends of a video or phone chat, our loud crunching often mistaken for static. 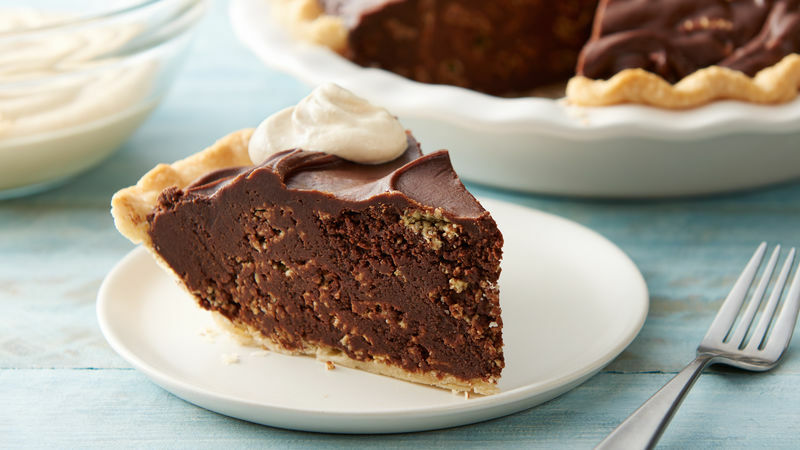 When I created this pie, I was hoping to spin our favorite snack into a rich dessert, perfect for any occasion dessert. When Sarah took a bite and closed her eyes, I knew she was on that van bench next to me, Muddy Buddies™ forever the best supporting actress to our lifetime of friendship.